Karen and Frank (the Owners) picked up PatiCat in Tortola, British Virgin Islands after she was delivered on December 29, 2001. 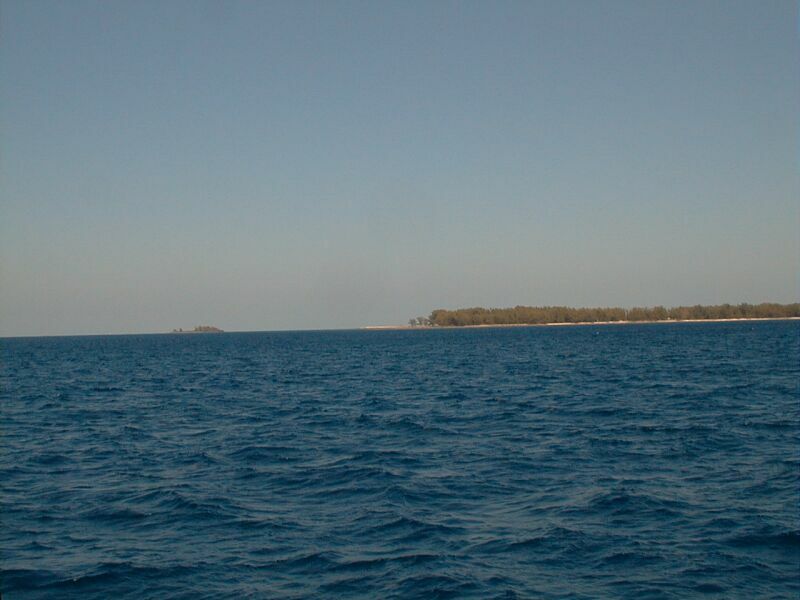 They departed on January 2, 2002 for their first true blue water passage. The fact they successfully made the passage is a testament to how well Voyage Yachts designed the Voyage 440 Catamaran, and the fact that PatiCat is so well equipped. 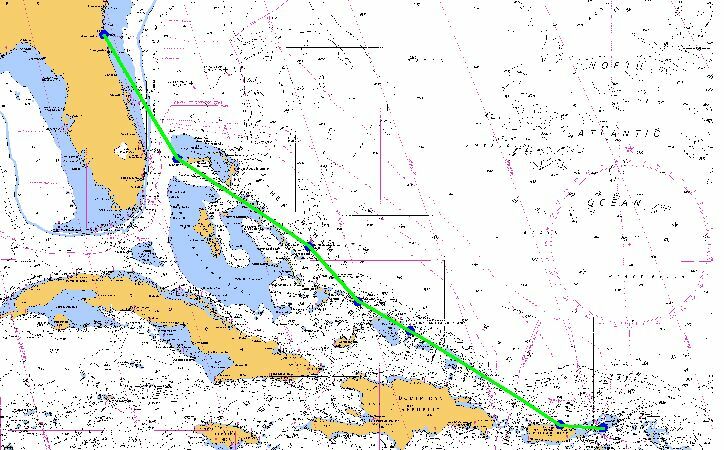 Things started out nice with pleasant sailing straight west from Tortola and we began passing Puerto Rico on the first night. We had not intended to stop in Puerto Rico if we were ready to continue. So, we sailed through the first night and most of the next day without any problems except some light winds forcing us to motor in the afternoon. Unfortunately, the calm weather on the second day was the calm before the storm. A strong front blew in straight on our bows (about 24-36 hours earlier than the forecasts Frank had checked before departing Tortola - maybe he read the dates wrong). 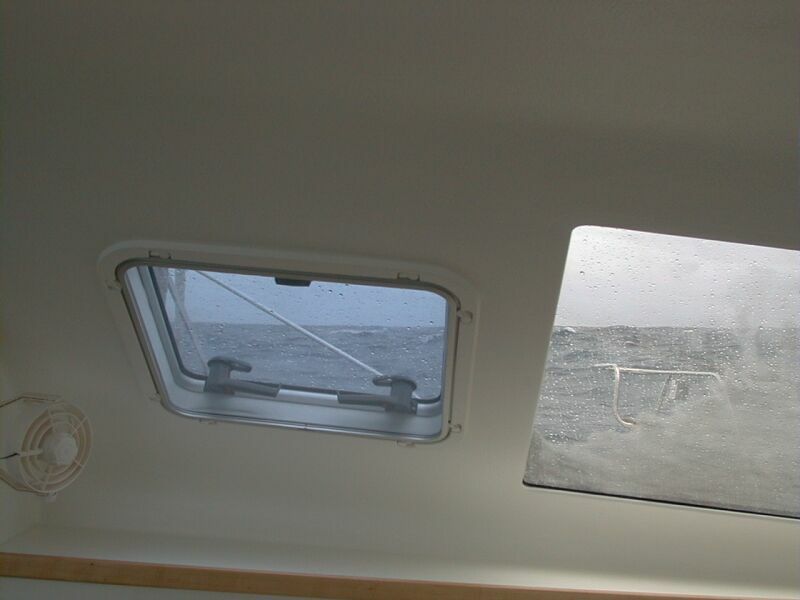 The squalls at the leading edge of the front included lots of rain and lightning and winds up to 35-40 knots. 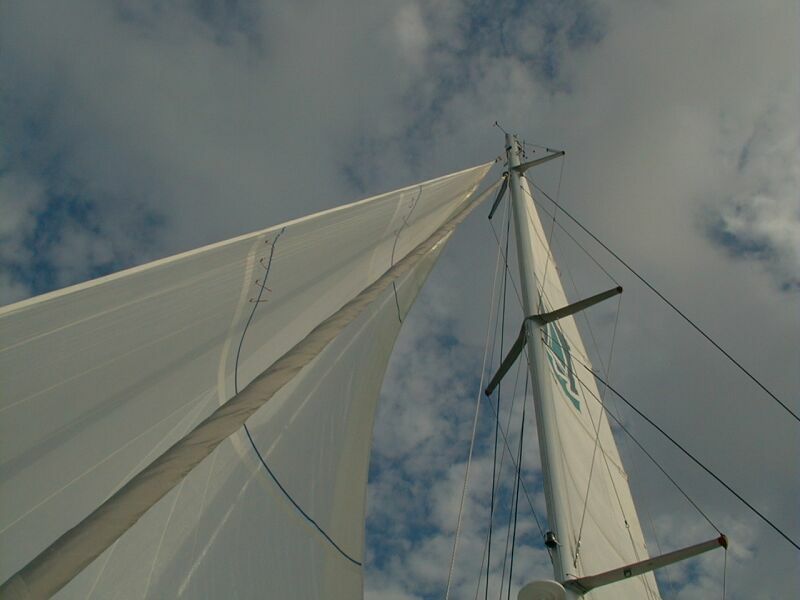 But, within an hour or two things "calmed" down to a steady 20-30 knots. This kicked up the seas to about 12-15 feet (estimated), and Frank learned a great deal about how to handle a Catamaran in these conditions. Karen, unfortunately, was a bit seasick. After several hours of no progress, Frank chose to go back to Plan B - return to Puerto Rico to regroup. In hindsight, waiting another day might have allowed the front to pass and continuing to the Turks - but, we had a great time in Puerto Rico. The nice thing about these shots - it was possible to spend most of the time on watch from inside the cockpit. Thanks to radar, good visibility from the salon, and a remote control for the autopilot. Another advantage to catamarans. 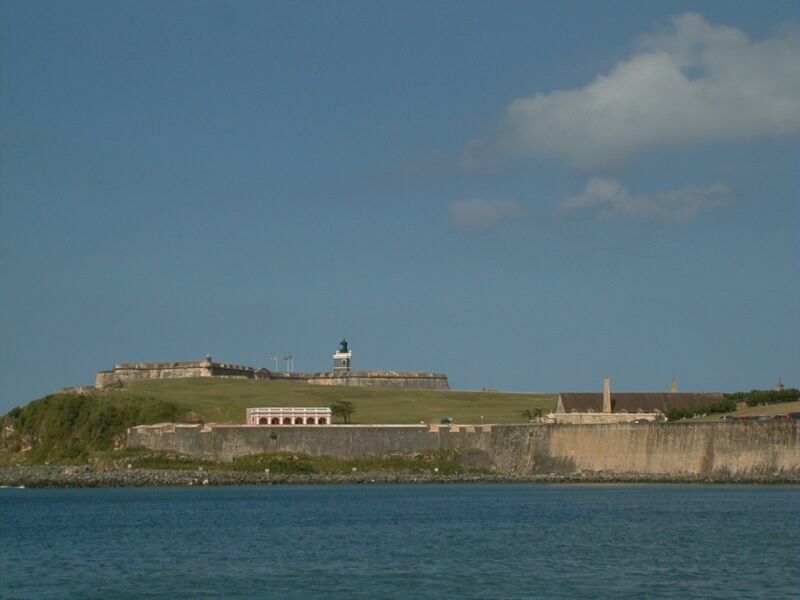 We left San Juan with a better forecast, and the sailing was very good. 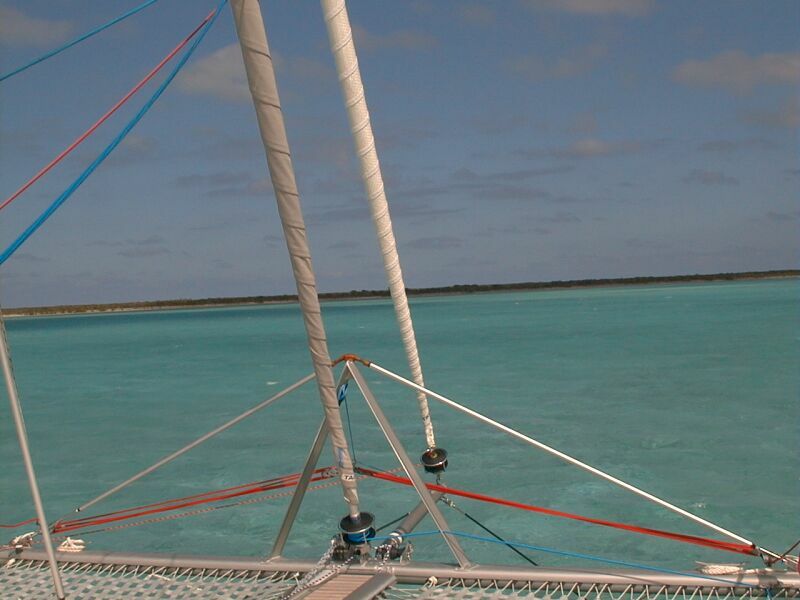 We had very little use for our engines until we approached Grand Turk two days later. 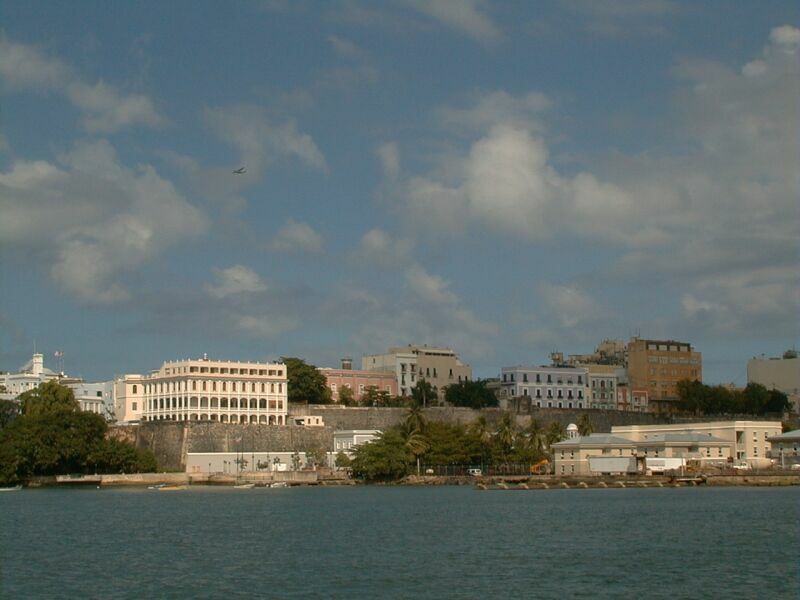 We chose to navigate through a narrow passage through reefs on the south side of the island. It turns out our electronic charts were very accurate, but Karen stood watch on the bow as we slowly navigated our way around the large coral heads. 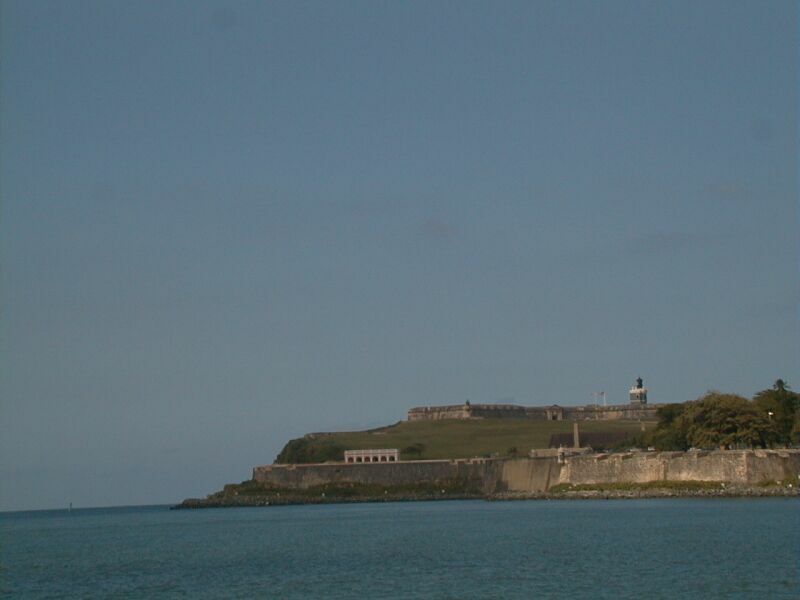 We anchored near the shipping peir on the southwest side of the island, and the port captain told us where to go for clearing in. We had originally planned to spend a day or two in the Turks and Caicos, but our diversion to San Juan caused us to rethink. So, we ended up only spending the night anchored at Grand Turk, and we didn't even provision anything while we were there. The next morning we cleared back out, and headed for Mayaguana. 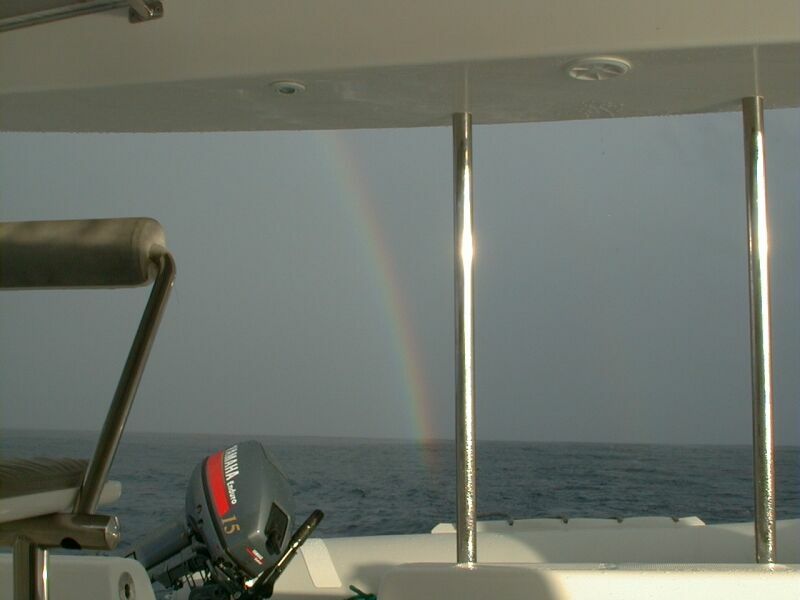 As we passed the north side of the Caicos, we had some wonderful views including several rainbows, and lots of dolphins. 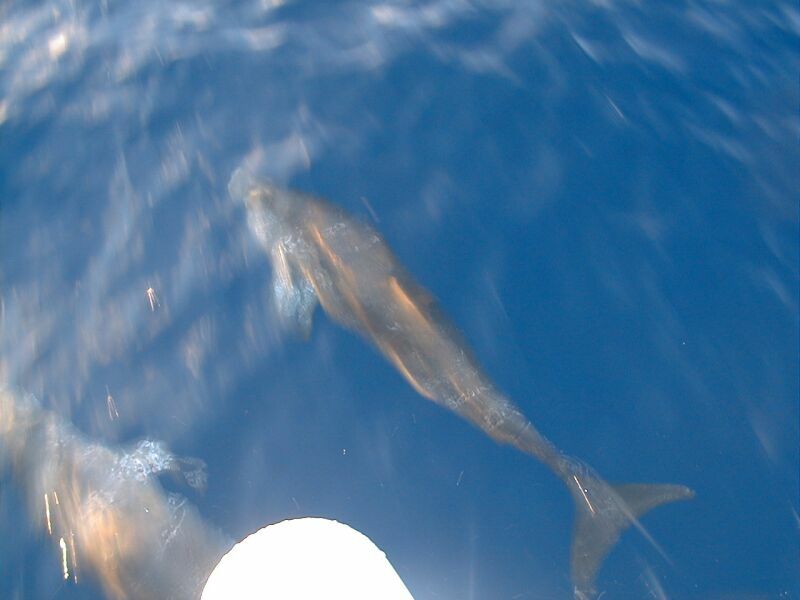 There's nothing like having dolphins dance under your feet at the bows of a catamaran. The dolphins love the bows that just skim the top of the water allowing them to dance right under it. They also like switching between the two bows. 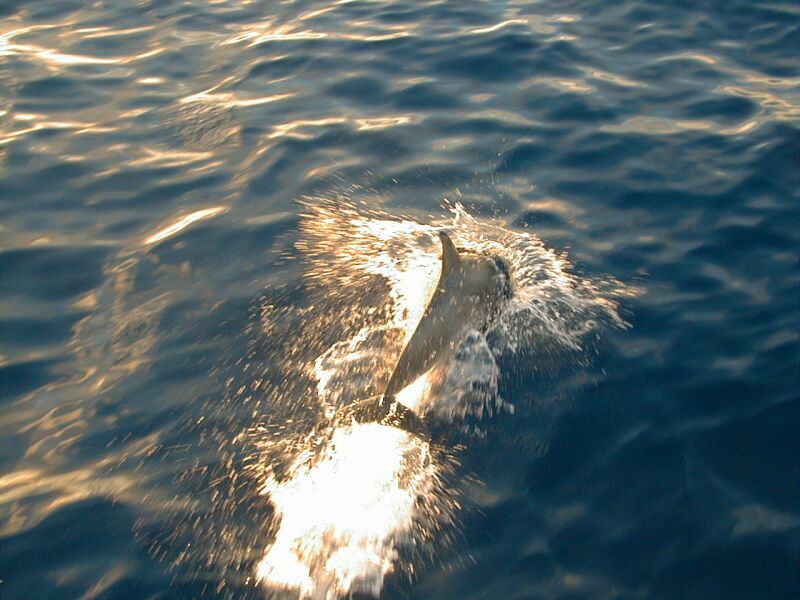 It's a thrill, and an honor, to have these lovely intelligent creatures visit your vessel. Mariners say dolphins bless your voyage when they come alongside. We certainly felt blessed. Trying to do things right, we chose to stop at the first available (most eastern) Bahamian island to clear into customs so we could anchor along the way as we continued our passage. This turned out to be a bad idea. First, because we didn't arrive to Mayaguana until early on Saturday morning. Although the books say you can simply pay a special $45 fee to get service on a weekend, they didn't explain how hard it would be to get the personnel on an island as remote as Mayaguana to accomodate. To a certain extent, we expected people to move slowly - but, it took Frank nine hours to clear customs. It might have taken longer if Frank hadn't managed to meet the husband of the customs officer. The same guy also helped scare off the dog which had chased Frank earlier. Mayaguana had a beautiful bay, but the economy on this island is quite depressed. Also, the channel through the shallow water to the mostly eroded pier is not clearly marked (Frank grazed some rocks with the new dinghy prop). We're pretty sure we won't visit there again, and certainly not to clear customs. Bizarre Events - Subs? Pirates? We left Mayaguna as soon as we cleared customs. It was already close to evening and was near dark by the time we left the shallow harbor. We were lucky our electronic charts were accurate enough to keep us clear of the coral heads, although we kept a close watch as we eased our way out. 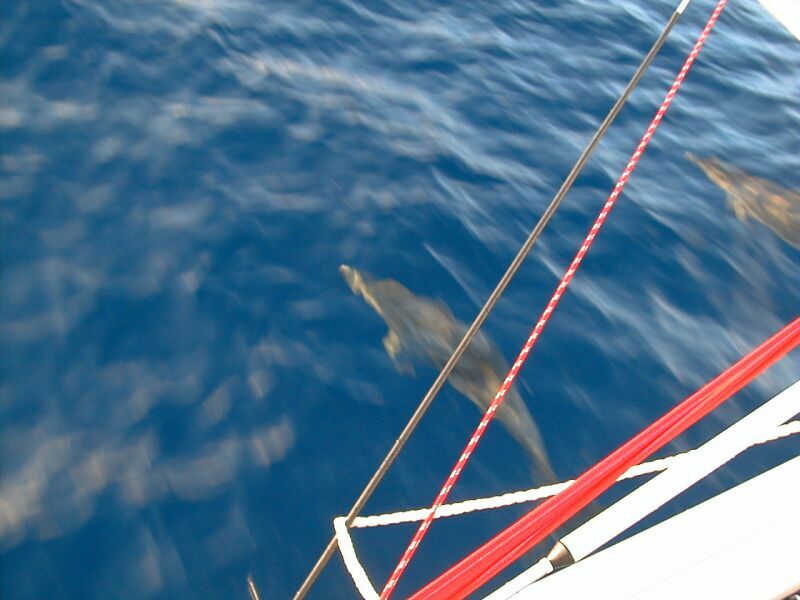 We sailed towards San Salvador passing to the southwest of Plana Cays and Samana Cay. As we approached Samana Cay around 1 AM, Frank was on watch. There were what seemed an unusual number of boats and ships in this area. Frank had at least 5 vessels on the radar at the same time. 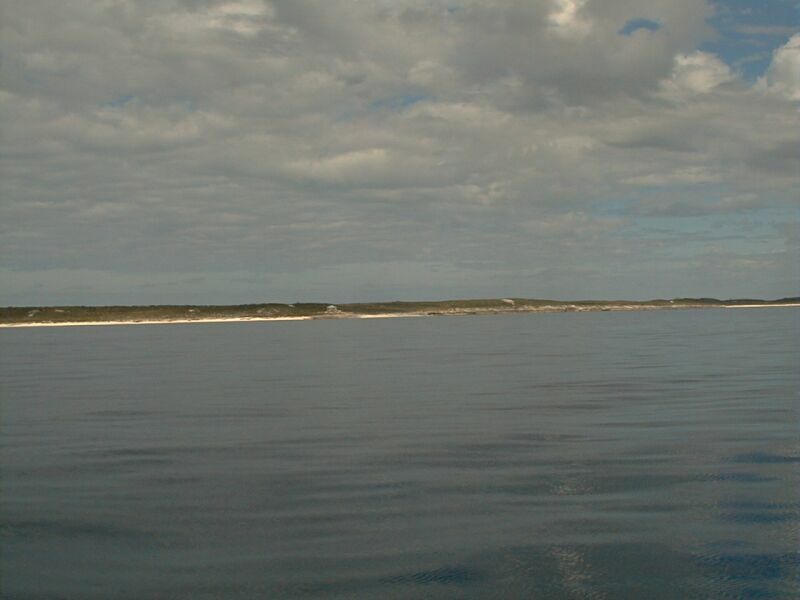 There was a sailboat about 2.5 miles directly ahead which appeared to be on an opposite parallel course. We had just started motoring a short while earlier. The night was beautiful, filled with brilliant stars and warm light winds. Frank was sitting at the chart table checking the radar and was watching closely when suddenly the heading reading changed from 345 degrees to 165 degrees! A 180 degree flip! Frank knew the autopilot would immediately turn the boat around and jumped up and turned off the autopilot at the helm. The boat had already made a quarter turn, so Frank guided the boat back by using the stars (our first use of celestial navigation). Thank goodness the sails were down! Frank had to turn on the light to check the compass heading which was now showing us pointed in the right direction. After power-resetting the GPS, the heading still showed wrong. Frank guessed that the electro-magnetic heading indicator was on a separate circuit, so he power-reset all the instruments. Good, the heading indications were fixed! But, what caused this bizarre event Frank thought? Some magnetic anomaly? Weird. As Frank was thinking about this, he looked up to check the approaching sailboat - now less than a mile away. Suddenly, it appeared the sailboat was now headed in the same direction - NNW. Because our boat was faster we were pulling along side. Then, the boat started heading straight for our boat. Frank wasn't too concerned, because clearly the boat was a mono-hull, so he was sure he could outpace her. 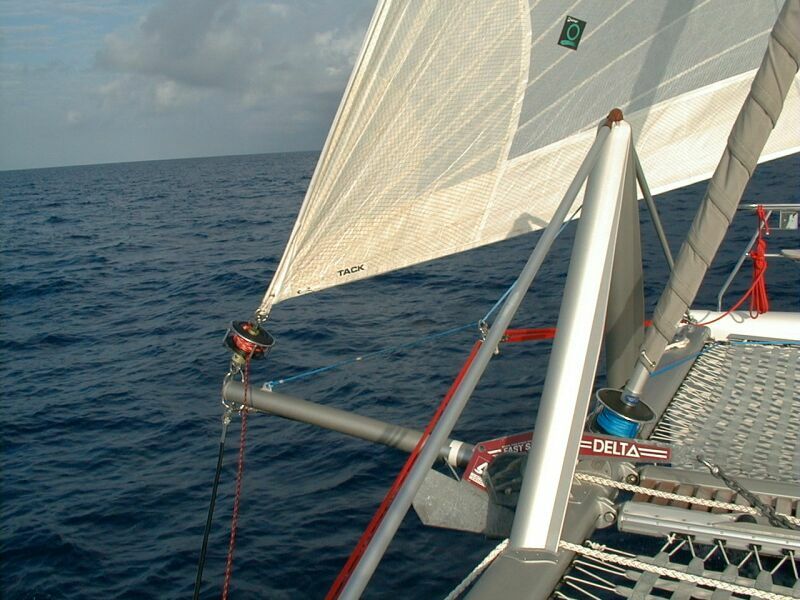 Then, the captain of the other boat started raising his jib to increase his pace while motor sailing. He was actually gaining a bit at this point, so Frank tried shining his spotlight at the other boat. Just to make sure, Frank increased the throttle and raised his own jib. The other boat clearly was losing ground at this point. Then, without any other indication, the other boat suddenly reversed course and started back in the same direction he had orginally been heading. Frank thought about hailing the other boat on the radio. But, what would he say? "Sailing vessel 18 miles SSW of Samana Key, you are approaching the Bahamaian Navy Training Catamaran Gunship - state your intentions." :-) Since the boat was leaving he decided the mystery was more interesting. Whatever it was, it certainly made for a most interesting watch and Frank had no trouble staying awake! The rest of the trip was rather uneventful as the winds continued to die on our way to San Salvador. Our favorite stop was probably San Salvador. Our approach was idealic except there was zero wind - it made for beautiful glass-like seas though. Not only was it a beautiful island, but we almost felt like we had the island to ourselves. There were only 6 other boats at the marina, and all of the others were fishing boats. We got fuel, visited the nearby beach (which we had entirely to ourselves) and then managed to round up a cook and have a nice dinner at the otherwise closed hotel restaurant. 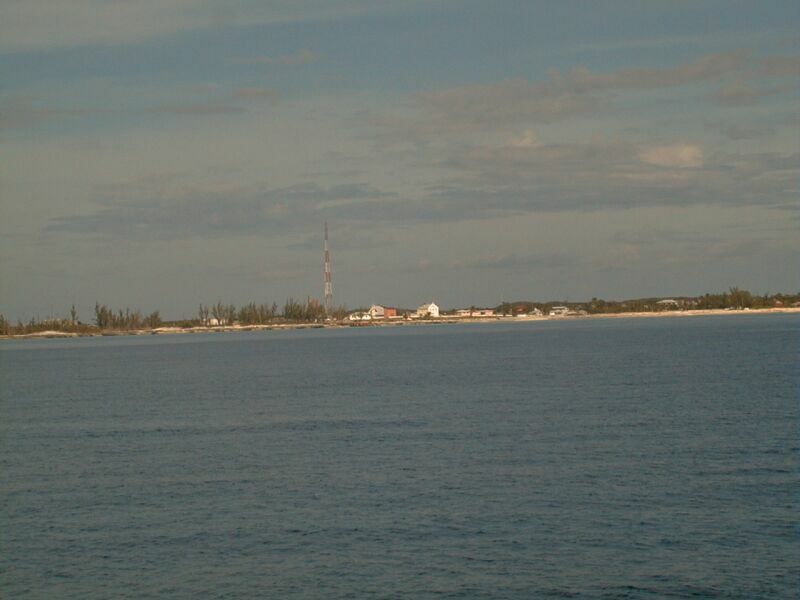 The final Bahamian leg was to proceed from San Salvador to Grand Bahama. 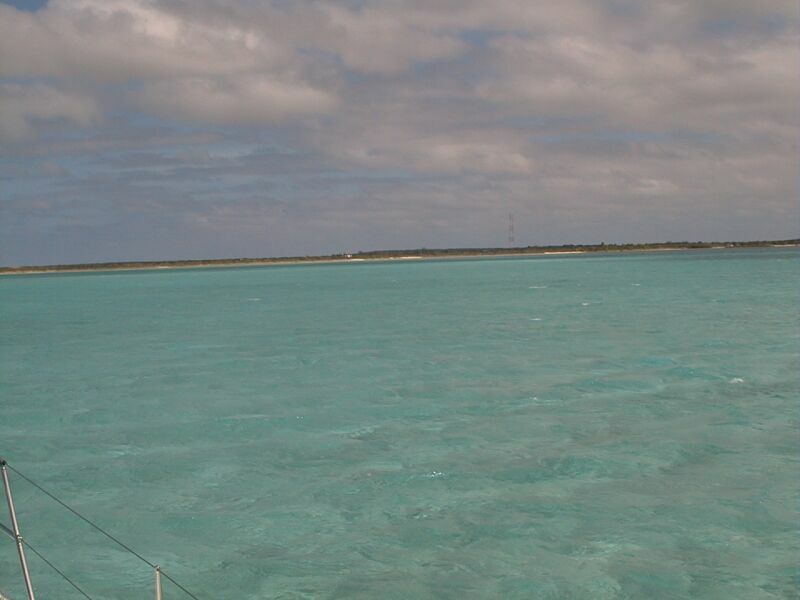 We had a nice day of sailing all the way past Cat Island and Eleuthera Island. 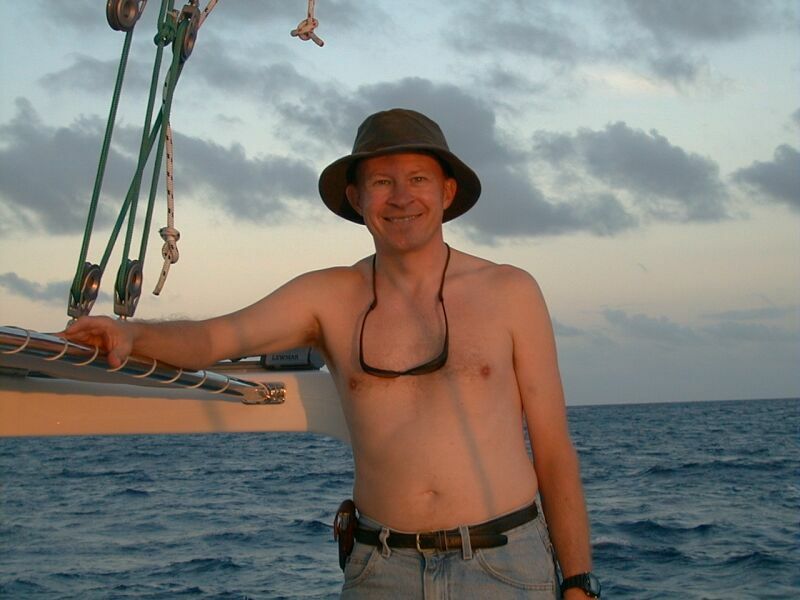 As we passed the final part of Eleuthera we were chasing another catamaran on the horizon ahead, and as the evening progressed we at least achieved even with the other boat until they headed off for some port elsewhere. 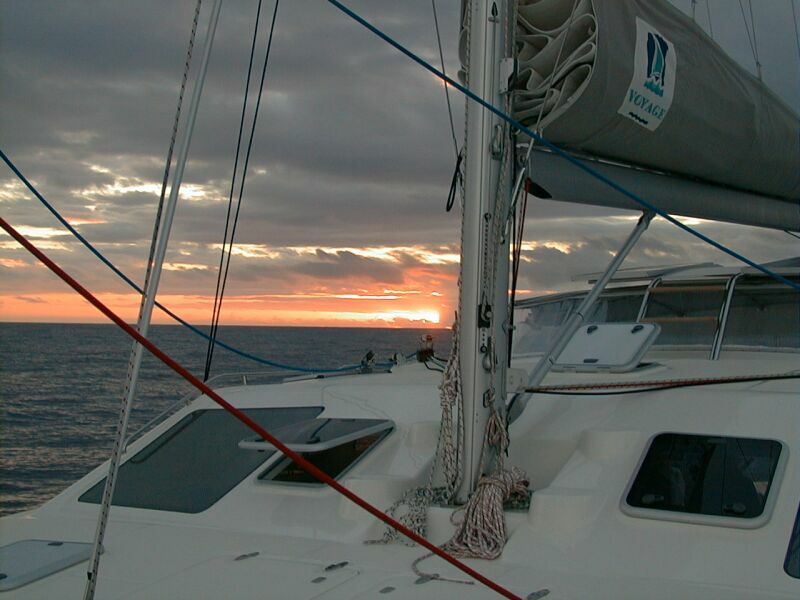 As the sun set, the winds really picked up, and we achieved our fastest speed of 13 knots over the ground with one reef in the sails. 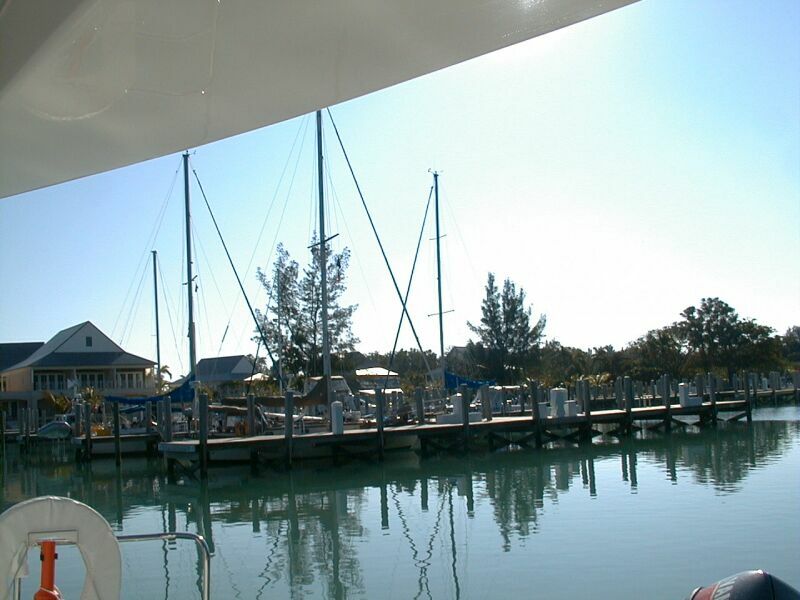 In the morning, the winds picked up again as we passed to the south of Grand Bahama Island and we made over 10 knots for quite a while. This was probably our best leg of sailing during the journey. 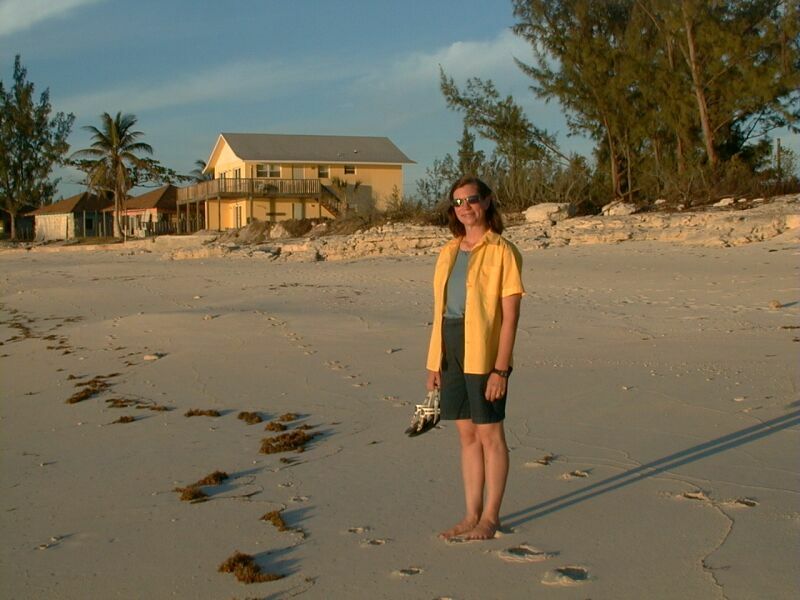 By early afternoon, we made West End and called ahead to Old Bahama Bay Hotel. The guy on the radio gave the warmest welcome! As it turned out, this was only the mildest sample of courteous, friendly behavior we received from all of the staff at Old Bahama Bay. 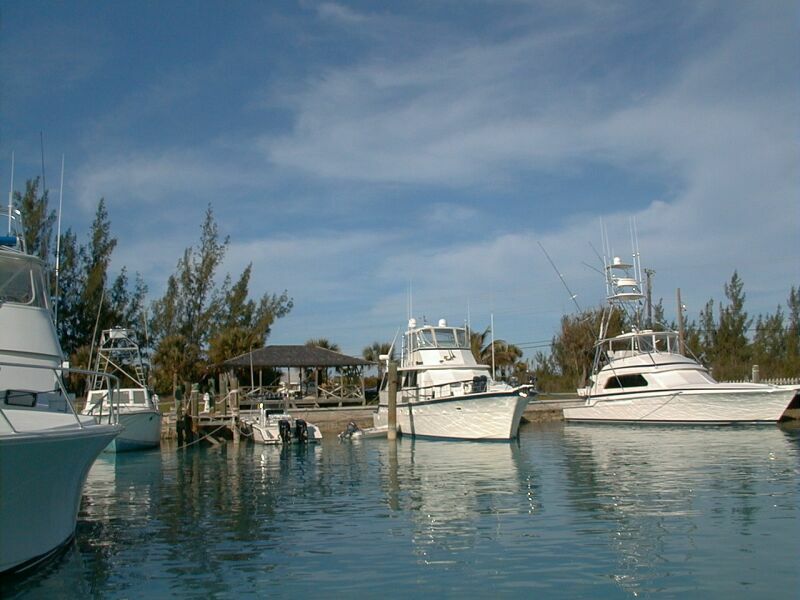 It's hard not to sound like a living advertisement for Old Bahama Bay Marina, because of the treatment we recieved. We suspect the lack of other customers had something to do with our treatment. It was January and, they admitted, their slowest period. According to the staff, the prices were reduced both for the slip and for fuel. And they were quite reasonable. We decided to go for a walk along the beach in the late afternoon. As we came up the beach a friendly staff member, who just finished helping some guests to their sailboat, stopped us to chat. He said, with the biggest smile on his face: "Hello, how are you on this most beautiful and excellent day!? My name is Ricky, Ricky Ricardo!" We laughed at his most exhuberant speech and, most likely, fabricated name. He chatted with us for a few minutes, asking us where we were from, how long we were staying, etc. Then, as we started to continue down the beach, he came running behind us and said: "I just had to tell you...when I first saw you two coming down the beach together...I just said to myself 'Who are those beautiful children walking down the beach!'." We just had to laugh at his ridiculous compliments and desire to make us laugh. It was just another example of the kind of steps the staff took to make its guests enjoy their stay. We had to say to ourselves: "if it's always like this, we'll have to come back!" The hotel and marina were being completely rennovated. In fact, an amusing aspect of our arrival was the construction to make more marina space nearby. 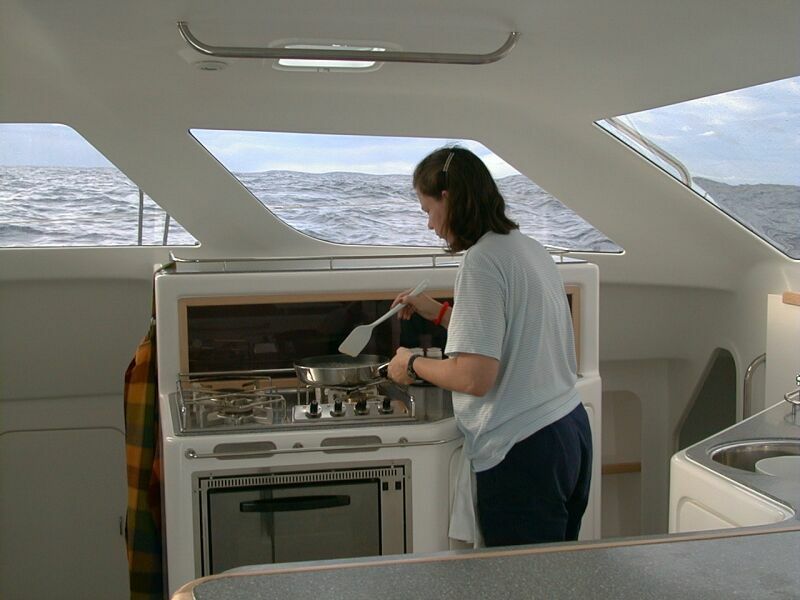 After we arrived, we felt refreshed enough to spend some time washing the salt water off the boat. As Frank was completing the washdown, the dock master dropped by to ask if we had been told about the blasting. "Blasting?!" Frank exclaimed. Apparently they were conducting a blast about 2 hundred yards away on the other side of a culvert. Frank imagined giant rocks crashing through the Paticat's beautiful new windows. The dockmaster assured us there would be no debris, but they didn't want us to be alarmed by the sound. The blast occurred without incident, as promised. No harm done. Karen and Frank went to dinner at the hotel restaurant, and the food and service continued to impress. The next morning, PatiCat was moved to the Fuel Dock and filled for the final leg. 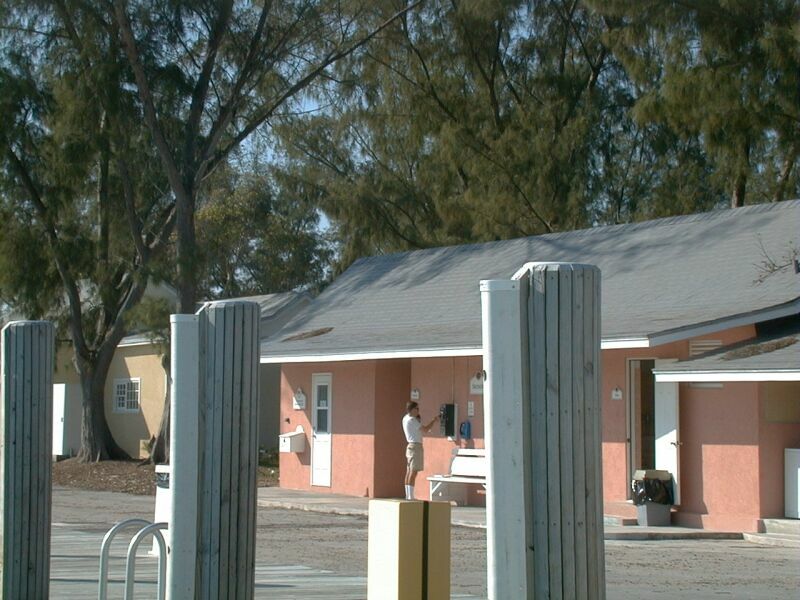 Right next door, was the Bahamas Customs Office. In 10 minutes, we were cleared for our return to the states. We made a couple of phone calls on the pay phone nearby, and departed by 10:00 AM. The weather looked ideal for the departure from West End. South winds were forecasted for most of the route. 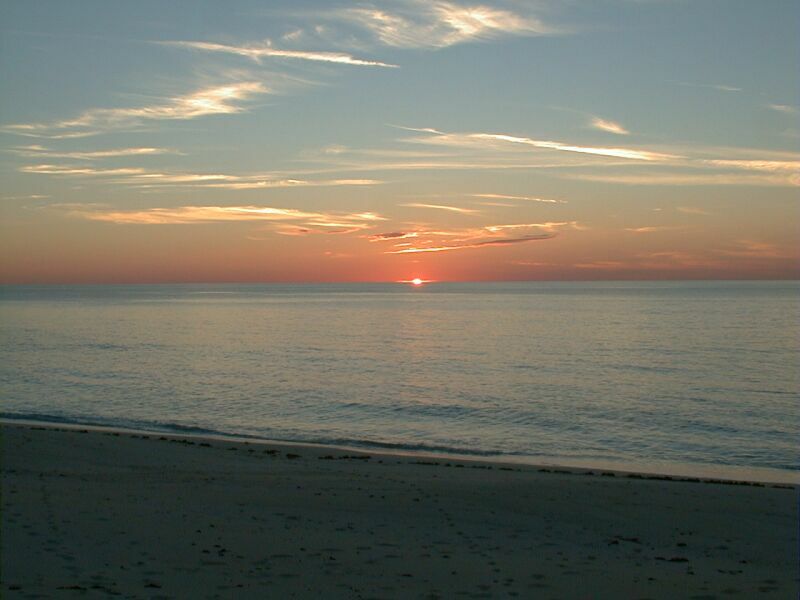 For those of you who know, these are perfect conditions for the route north along the Gulf Stream. 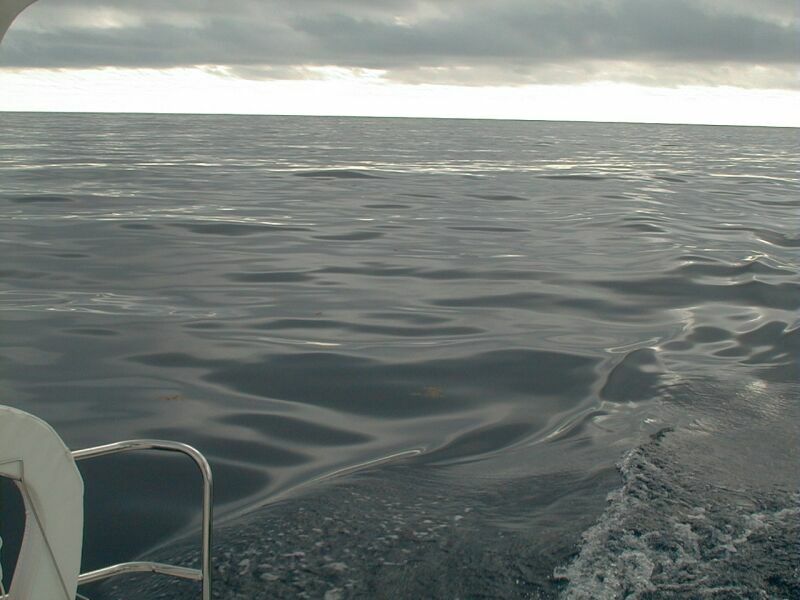 Since the Gulf Stream current runs north, if the wind goes with it - the seas are flat. If the wind goes opposite, you get rough waves. Sailing with the wind with a 4 knot current following you is a dream! We scooted along at over 12 knots according to the GPS all day and night. 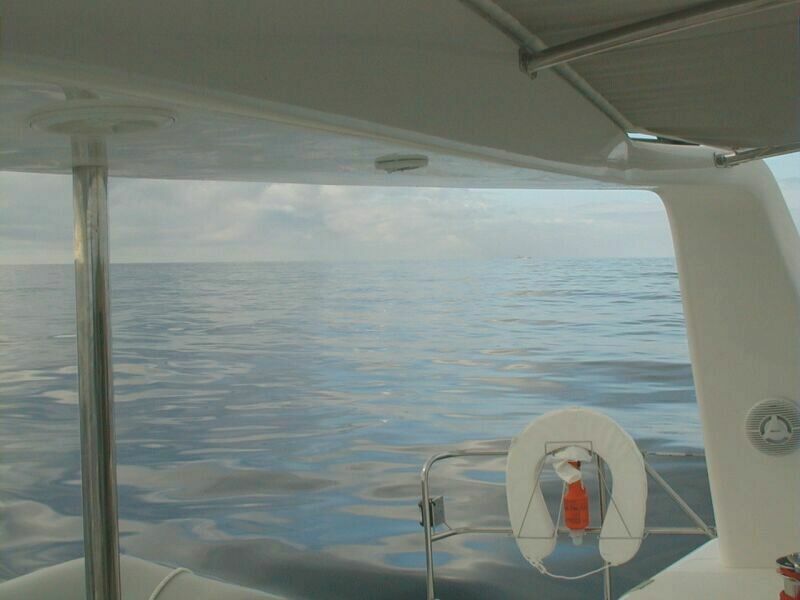 By early morning we had to start leaving the Gulf Stream and heading towards Jacksonville to the north west. 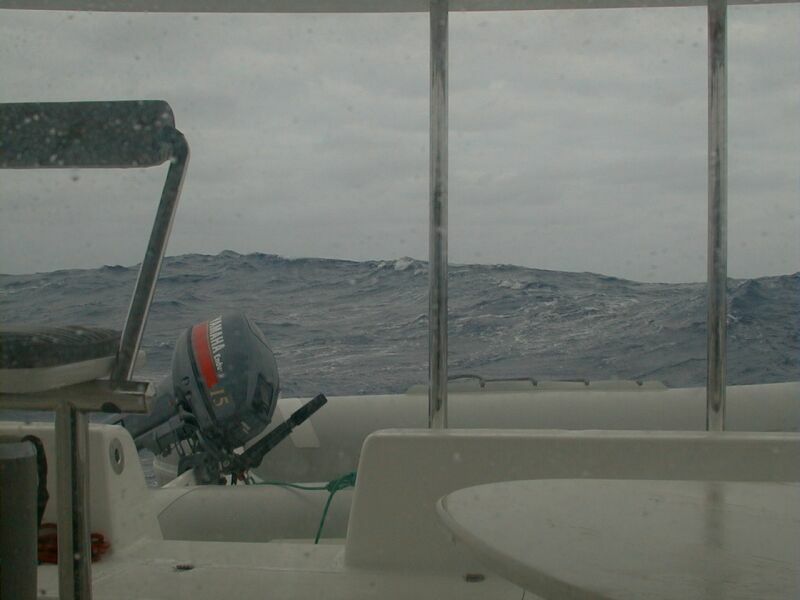 Unfortunately, the winds turned against us and as exptected the seas turned choppy. 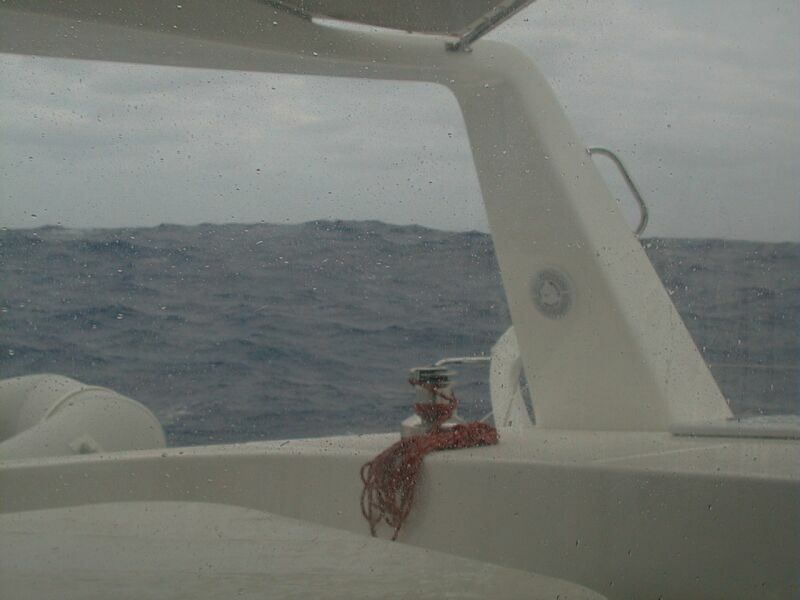 We tried plowing through the waves for a while (with the motors, since the wind was on our nose - catamarans do not tack well into the wind - and we were ready to get home!). But, it got too rough. In fact, a couple of the grommets that hold the trampolines on busted due to wave action. Frank had checked the weather radio and the whole coastline was experiencing almost no wind. Yet, we were experiencing 15 knots from the north west! So, we decided finally to head due west. While we were out there (nearly 40 miles off shore), we encountered two or three crazy fishermen in small boats trying to fish in the wicked surf. We couldn't believe they were out there! A few miles closer to shore, the winds suddenly died off. The seas were calm closer in! As we continued NNW up to Jacksonville, we saw dozens of fish jumping for joy on this splendid day. We laughed as we thought about those crazy fishermen enduring such hardship when they could have caught these beautiful fish from a placid sea! By late afternoon we had Jacksonville in sight. We called ahead to U.S. Customs, and they were expecting us. Since we weren't going to pull into our slip until evening, they and were tired from our journey, they agreed to send an agent to our boat in the morning. Unfortunately they explained we would have to pay duty tax on the boat despite Frank's understanding that South Africa was exempt from the duty tax. Fortunately, the mess was straightened out a couple of weeks later and the U.S. Customs not only refunded us, but paid us back with interest! After entering the St. John River, PatiCat needed to go down (south) the Intracostal Waterway about 6 miles to get to our marina. There were two sets of power lines and a bridge we needed to clear first. The tidal range is quite high, and we knew the low tide was about 6:00 PM. The sun set at about 5:30 PM, so we would be going down unknown waters at night and under a bridge with a 65 foot clearance (PatiCat clears with 63 feet). We were too anxious to get to our destination, so we decided to make a go of it. There was an evening moon to help out and twilight lasted until 6:30. We were running a bit late, but got to the bridge by 7:00 PM. The tide looked very low along the way, so we felt safe. We approached the bridge very slowly, and although it looked terrifying we cleared under without a problem. On the other side, we noticed a sign at the water which indicated the bridge had 68' of clearance at that moment. Whew! The channel to the marina was awfully narrow. We found out later it was a good thing we came in a bit past the low tide, otherwise we would have dragged bottom as they were dredging the channel that month to improve its depth. But, we got in safely. Of course, as we tried to pull into the slip, we struck bottom (fortunately just mud). They had us in a slip closest to the base, and it needed dredging. The other boaters did remark it was the lowest tide they had seen in a long time. Fortunately, some friendly boaters in a nearby side-slip offered to move their boat and let us pull in alongside the dock. It was getting late, and we quickly took them up on their offer (later we became friends with the friendly couple). It was a most excellent first adventure in our new boat. Just the beginning of many more - we hope!